I am not sharing much savory recipes on my blog simply because I am a sweet tooth and a baking lover. 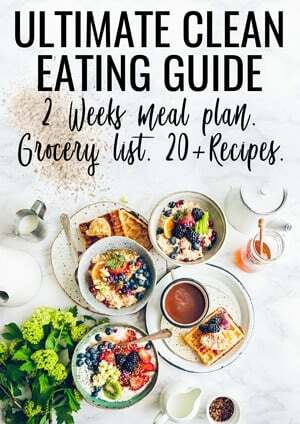 But today I thought it will be great to show you what I eat very often as a dinner – apart from wraps – you know how much I love to wrap everything from my fridge in my coconut flour flatbread for a quick dinner right ? But lets be real I don’t eat sandwich or wraps everyday. 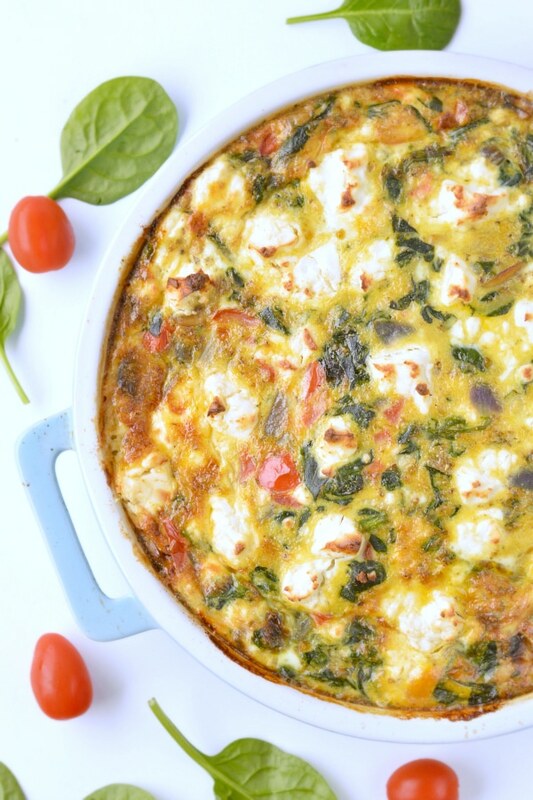 I also love a quick and easy tasty meal like this spinach frittata feta goat cheese on top ! Yum. 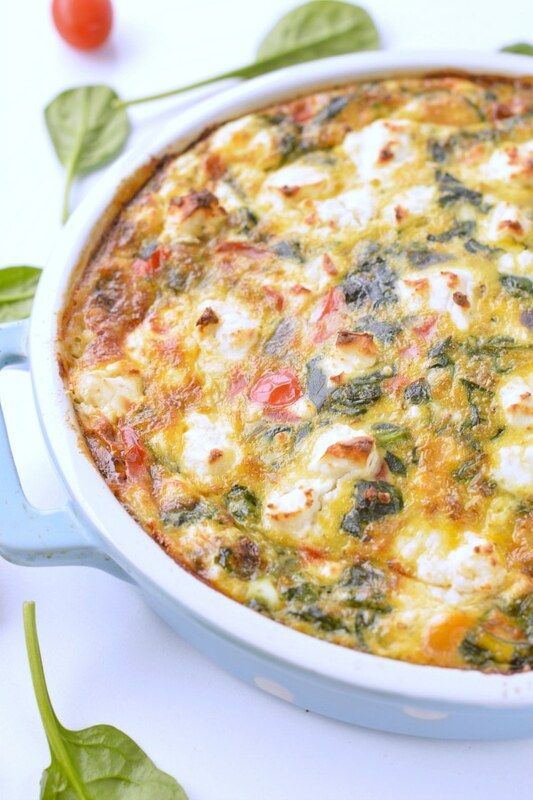 And good news, this spinach frittata is keto, low carb and gluten free as there is no flour involved and only low carb vegetables in this recipes. Eggs – of course, that is the base of this meal if you are vegan (not low carb eater as my husband) use my vegan chickpea flour frittata recipe here. Mushrooms – if you don’t like mushrooms, you can use some bacon strips or ham! 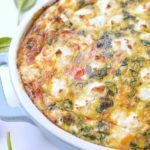 What I love the most about this spinach frittata is that it makes both : a delicious light dinner or a quick protein breakfast. It also freeze really well in airtight container up to 1 month. I always defrost my food the day before in the fridge and rewarm my frittata in hot oven for 5 or 8 minutes on a non stick tefal pan. Set up your oven around 150C and rewarm until it crisp on top. Microwave is also an option but it makes the frittata very chewy and watery if it has been freezed so I don’t enjoy it much. 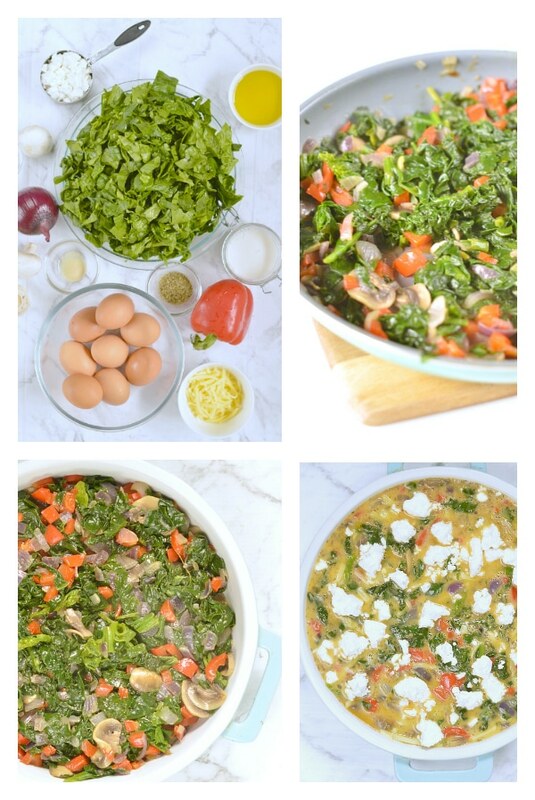 Enjoy this 30 minutes meal and let me know if you want to see more savory recipes on the blog ! 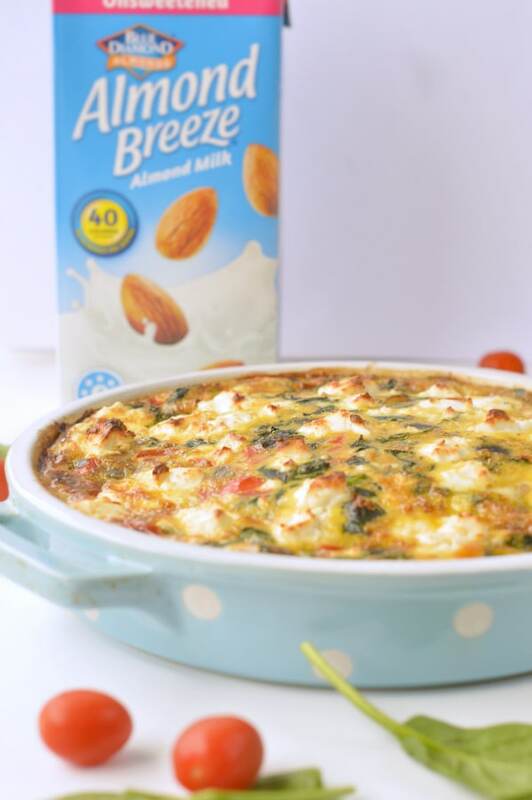 Watch the spinach frittata feta, capsicum mushrooms recipe video and make it now ! Preheat oven to 200 C (390F). Spray olive oil into a large baking dish with high borders to make sure all your fillings fit. Set aside. In a large mixing bowl, whisk together eggs, unsweetened almond milk, garlic powder, salt, dried oregano, salt and pepper. I used a hand whisk and this process took me 1 minute, don't over whisk. Simply whisk enough to break eggs and combine with milk and spices. Set aside in the fridge. Under medium heat, warm olive oil into a large non stick pan. Stir in the diced red onion and cook for 1- 2 minutes until fragrant and transparent. Stir in diced capsicum and sliced mushrooms. Sauteed the vegetables for 2-3 minutes until roasted, fragrant and mushrooms have released their water. Pile the chopped spinach in the pan, cover with a lid, reduce to low heat and cook, stirring every 30 seconds until the spinach leaves wilts. It will significantly decrease in volume as spinach will release their juice/water. Remove lid, stir and cook for an extra 1-2 minute to evaporate the water from the spinach. You don't want to add water in the frittata or it won't firm up in the oven. Note: If your pan is too small, you can simply add the spinach in two times, repeat the cooking process two times. Transfer the sauteed vegetables into the baking dish. If there is vegetable juice in the pan, discard, don't add in the baking dish. Pour eggs mixture on top of the cooked vegetables. Add grated cheese, then give a quick swirl with a spoon to evenly combine the egg batter, cheese and vegetables. Crumble the goat cheese all over the top. Bake in the middle of the oven for 20 minutes or until the filling is set. Check if cooked through by cutting a tiny bit in the center of the frittata. If not set, bake longer. Serve hot with green salad on side. Frozen spinach can be used and you will need 10.5 oz. 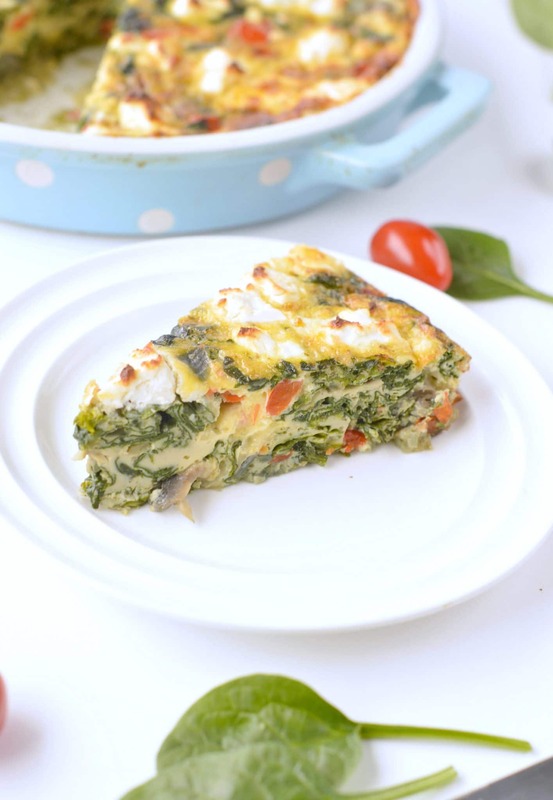 This recipe serve 4 large slice of spinach frittata.